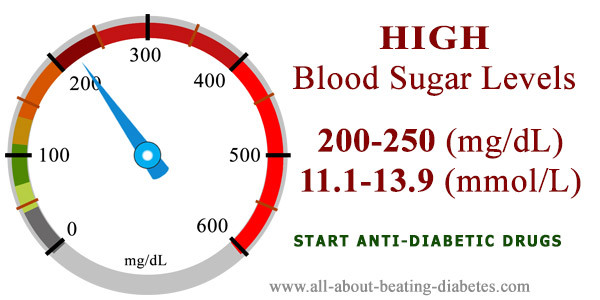 Blood sugar level 200-250 mg/dl is considered as diabetes. If having such increased glucose level, you should start immediately anti-diabetic treatment. 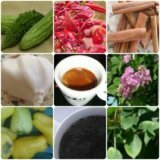 If left untreated, it will predispose for the heart, brain, kidney and eye issues, among many other problems. In this case, the drug therapy is the first choice. It is combined with lifestyle changes such as weight loss, a healthy diet, and moderate physical activity. Sometimes, these levels of glucose are secondary to the use of certain drugs such as thiazides, steroids, statins etc. In this case, stop immediately the use of this drug and consult with a doctor whether you need to start the use of anti-diabetic drugs for a while, or not.